The newly launched Omnichannel Communication System is perfect for maintaining office communications. It is designed for consistent message and relationship across multiple channels. It connects every communication channel to synchronize them together and make them work in same flow. It works to give a reliable and flawless experience to customer across multi-channel. Companies that uses a well-implemented Omnichannel solution, offers amazing customer service level. Studies shows that, companies with Omnichannel communication system have better level of improvement on customer relation rates in compare to others. It handles the message flow and call flow during peak hours with most managed attributes. It offers the power of communication to customers with simplifying the way of service process. In traditional communication system, it requires to start again after every channel switch while Omnichannel offers flawless channel switching without the need of restarting the conversation. It offers a unique experience to every customer through their preferred channel. It allows customers to have a unique experience through their preferred channel and enjoy a seamless experience. With Omni Channel Communication System, it’s easy for agents to see history of customer communications which help in handling the call smoothly. It offers a unified and seamless communication system through all mediums such as voice or chat. It’s easy to run marketing campaigns through this system. It offers extreme synchronization with mobile, email system and other communication means. It is a cloud based communication system that offers centralized insight of employee & customer data. This advanced communication solution integrates easily with existing software and quick insight of sales need. With this system, you get enriched customer data, history, firmographic details and other behavioral details. All these data helps organization understand the insight of sales need and agents work both. With growth of organization, leads and existing customers connects to the brand. To maintain such brand standards, Omni Channel Communication System helps with sales improvement and customer relation maintenance. Omni Channel Communication System also sends push notifications via mobile apps which makes it easier for customers to stay connected with the brand. MIS Reports would be generated as per day to day to operations. There can be types available like open/closed/escalated reports. The reports would be available to those users only whom admin has given authorities to access it. MIS users would login into the CRM panel and view the listing of available reports. To view a particular report, there will be filters/parameters available which users’ needs to select and the report would be displayed accordingly. Reports can also be extracted in excel format. It is mandatory to select the report type. Validations should be applied on the date & other parameters for viewing the report. Once user click on export button, it should display the option to save the report in the excel format. This section of the document specifies the functional requirements of client. It would provide complete work flow of complaint via Multiple mediums and specified the details that user should receive on successful implementation. As call connects with Agents, the system will call client API to get details of consumer such as Name, Key Code etc. on basis of Mobile number. a)	Information Call-One button will be given on user screen to access CRM consumer page. The user will then check the respective details and share with the agent. b)	Register complaint- Clicking on complaint button will take the agent to CRM page of consumer details. In there the agent will be able to generate complaint based on issues like No Current, Other Complaints, and Transfer Burnt etc. and in response share the complaint number with him. Complaint Assign to FRT - Based on selected Subdivision, complaint would be going to bucket of concern FRT. They get alert while receiving complaint assigned by system (auto-assigned) or administrator. Accepted complaint would add into task list, One SMS will be push to consumers with tracking link of FRT. On closure of complaint, User will take consumer's signature & comments on android phone & also capture the Latitude & longitude of consumer site. All the captured details through mobile app will be pushing to CRM back to maintain the records. Rejected complaint will ask reason from user and sent to administrator. Complaints can be rejected due to out of scope or not lying in FRT Area. a)	Feedback call On closure - Agent would do the outbound calling on closure request to get consumer feedback on resolution provided by FRT. Complaint will be closed If consumer will be satisfied by provided resolution otherwise complaint will be open & escalate to team as per the hierarchy. b)	Follow up calling – Agent would do follow ups for resolutions on escalated cases. Complaints will be specified in different color code at every stage to ease of understanding. The technical work flow of Omni Channel Communication System is divided into three prime section comprises of Primary architecture, Cloud 1 & Cloud 2. Complete set up of CTI/Database servers will be place on Primary location. Users will be connecting to primary location and seating locally. 8 PRI lines from each service provider will be terminating at Server end through gateway. Primary server will receive calls on toll free, short codes through BSNL PRI lines & on direct other service provider number through other service provider PRI. NES Drive needed at primary site with space of 10TB for storage. Require one server for CRM to access locally. FTP Server-To Store Voice files. Omni Channel Communication System is comprised of huge technical application which requires a flawless integration. This system require API from the client for third party application such as SCADA, Mobile app; web Portal, GIS, Revenue Management System, Feeder Monitoring system, DT Metering system etc. for a smooth integration. 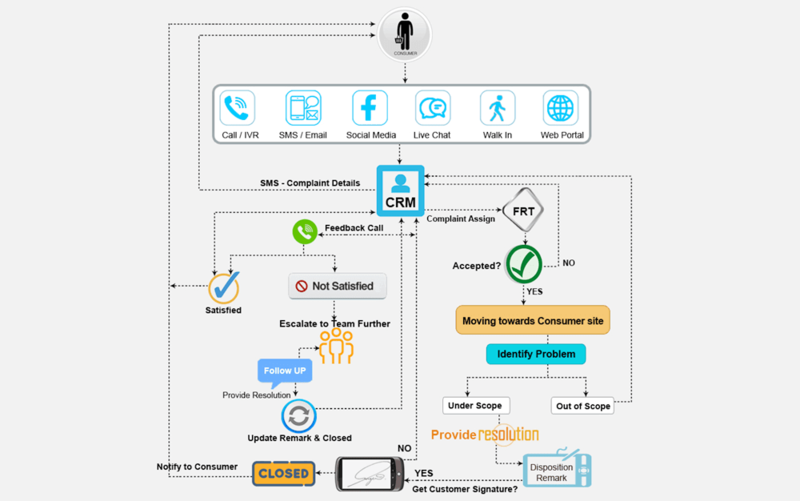 SMS API provide by client -it will be deliver on registration of complaint, On FRT Assigning, Resolution of complaint, On closure, Reopening of complaint, Escalation of complaint etc. Database -Consumer database along with billing server details require with integration of CRM. Vehicle tracking system -Need FRT Location URL for Tracking and it will share with consumer while accepting of complaint. The above integrations are done as per user requirement and requires user’s gateway to accomplish the task. Alerts and Events Omni Channel Communication System is designed for improved Alerts generation for events or registered complaints. The alerts system and even creation works in the following way. Complaint Rejected- this could happen in two possible cases; either it can be out of scope or not lying in concerned area. In this case, the user will get alert notification for the same. The user will also get notified if any complaint escalated to next level of management hierarchy. In this case crossing SLA notification will be sent to the user. Other -It will also notify the system about any action taken against a complaint by the user or management.